Despite a rather complicated and genuinely chaotic evolution, our P9-facilitated generation mechanism of these objects predicts a rather specific orbital distribution in (semi major axis a) - (inclination i) - (perihelion distance q) space. This prediction is shown below as a background green/gray grid, with observed data over-plotted as purple/black points. In addition to the observed objects that were already known back in October of last year, this plot shows two new data points that also fit the simulated pattern beautifully. 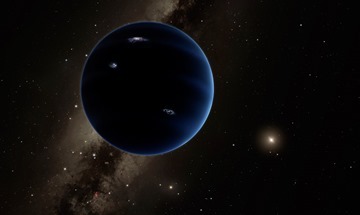 Thus, the predictions of the Planet Nine hypothesis have held up very well within the more proximate part of the trans-Neptunian region, where the planet’s direct influence is minimal. Cumulatively, I can’t help but feel an uneasy combination of relief and disappointment. On one hand, the agreement between simulations and data implies that the theoretical model remains on solid footing. As we head into upcoming P9 observing season, this is important and reassuring. On the other hand, we haven’t learned anything genuinely new from the expanded dataset, and P9’s precise location on its orbit as well as a well-founded qualitative description of P9-induced dynamics remain somewhat elusive. Clearly, much work - both theoretical and observational - remains to be done. So back to research. How confident are you that you or someone will find it in the next search season? How probable is it that it is not an ice giant but a rather rocky planet? These things are notoriously difficult to predict because weather is involved, as well as telescope malfunctions, etc. I'd give us a ~20-25% chance of finding it in this observing season. We designed our search with a ~5 year timeline in mind. Given its mass, it's probably an ice-giant. What would the effects of P9's mass be? For example, if the mass was greater, would a wider orbit be more likely? Or would it only influence to what extent there can be outliers? Yes - there is a tradeoff between P9's semi-major axis, mass and eccentricity. To leading order, the more massive the object, the wider the orbit should be. You forgot to add two links (see news coverage here and here). Oops! Thanks for pointing this out. Updated. Could Kat Volk's and Renu Malholtra's new planet explain why ETNO's haven't been found with perihelia between 50 AU and 70 AU? 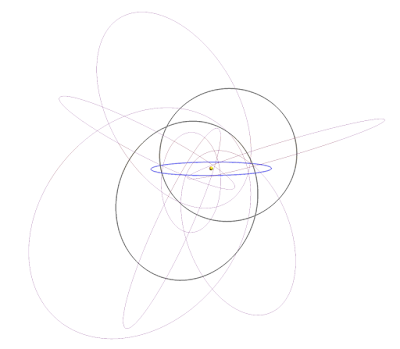 Some of the recent posts here make me think that the only way to get the orbits of Sedna et al. into their current position is for them to have been acted on *constantly* by Planet Nine all the way from its formation to present day, but I wanted to rule out the idea that the reason we haven't found Planet Nine thus far is that it existed but has long since "left the building." Sorry for such an elementary question, but I wanted to check whether my understanding is sound. 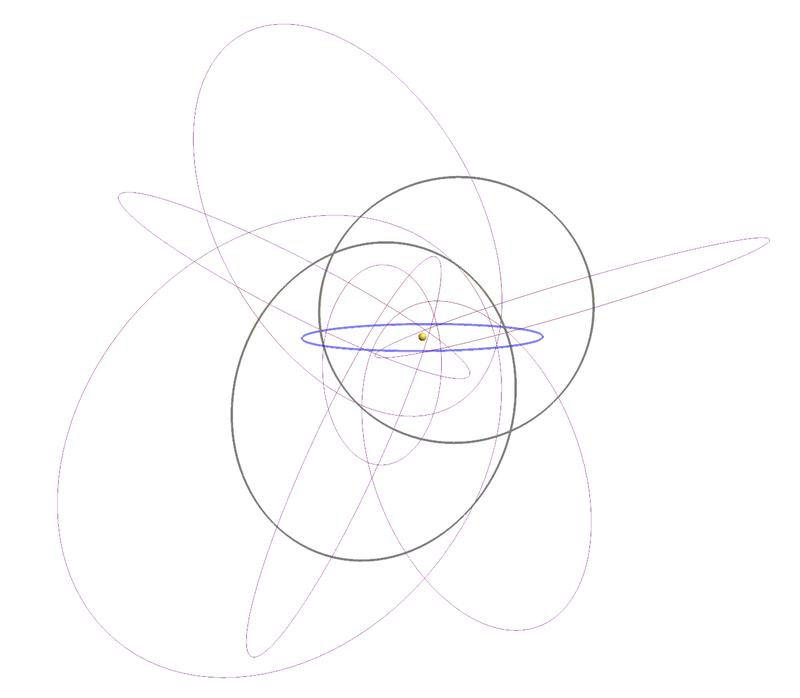 I would also assume that while the objects would remain on extreme orbits if P9 was already gone, other gravitational disturbances would cause them to lose their specific properties that point to a common source. Not at all an elementary question! But thankfully one that has a well-defined answer. If the clustering we see were due to some gravitational disturbance in the past, and not due to an extant perturber, this disturbance would have had to happen relatively recently (in cosmic terms). This is because due to the well-understood effects of Jupiter, Saturn, Uranus and Neptune, the distant orbits of Sedna, etc would precess differentially on a timescale of ~100 million years, and the observed pattern would be destroyed. Thank you for such a nice answer, Konstantin Yurievich! :-) I appreciate your taking the time to explain why the model only works with P9 still being present. P9 is likely to have satellites of significant size. IF they are close and are ice covered, this ice surface might be renewed by Ice volcanoes / surface plate activities. With a high albedo might this complicate the computer recognition of the steady orbit of P9? Our theoretical models that *predict* the existence of P9 don't say anything about its physical appearance - only its mass. If P9 has a high albedo, however, that greatly helps the astronomical search. I think "Unknown" meant that the computer might not recognize a larger grey orb if a smaller white orb would move around it. The bright moon's movement would not be regular, and therefore not recognized, and the dimmer planet would be outshone by its moon. Ambi, that is correct. All of the planets beyond Earth have satellites and certainly there are plenty of icy bodies to be captured. We have one " double planet " in the solar system ( Earth) where the moon has a significant mass compared to the planet. 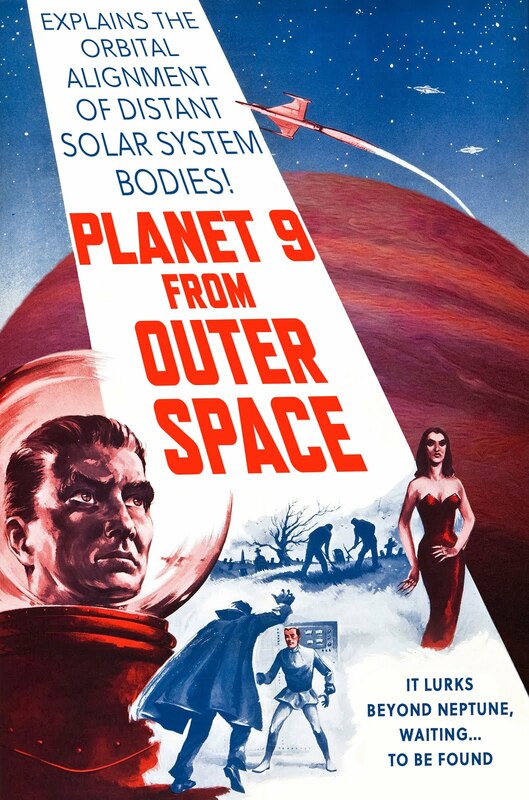 if P9 has a terrestrial Moon the size of Earth or Mars, it may outshine a P9 of say, 8 earth masses. Its path would be back and forth across the sky in short steps, and hard to pick out especially with an unfavorable survey cadence. I was also interested in knowing how the orbit of P9 has evolved. If it has impacted the angular moment of the rest of the solar system by 6 degrees, that means it has "moved" the orbits of Jupiter, Saturn, Neptune and Uranus. certainly the inclination of P9 has shifted by a lot and this shift can be modeled . Is this shift consistent with constantly evolving "scattered objects" orbits? In the computer models is the orbit of P9 allowed to change over time, with only initial parameters set? PS as "unknown" I am new to this blog. My normal handle is JD Kittle. Had a thought. Could most stars have a "heliopause planet"? I read that the solar wind blows out about 1 Earth mass of material every 150 million years. If the galaxy or other forces do not strip this material away, it will pool. Our sun's heliopause is about 120 AU. A body orbiting in this region could accrete some of this material and grow into a significant planet. Of course the heliopause is roughly spherical, while an orbit is a thin ring, so maybe not. I suppose Planet 9 is too far out for this effect, but Planet 10 might be at the optimum distance for it. Interstellar matter and the Solar System are moving through the galaxy in different ways. From the viewpoint of the Solar System, there is more interstellar matter coming from one direction that the others (and in that direction the heliopause is closest to the Sun). So matter lost by the Sun will be stopped by the heliopause and then be carried off with the interstellar matter, and would not remain in place until it would gain enough mass to contract to a body. How much longer does the observational season last and how does that translate into depth of the search against targeted areas? Have you had good conditions and any equipment problems? Exciting times..
Just wondering if there have been any ew thoughts or findings now that we are in the middle of September.? Thank you for writing this blog, Konstantin - could Planet 9 be the "Guest Star" of 1054AD that the Chinese recorded? vitamin deficit prompts our systems to breakdown its fat reserves, and this leads to diet strategy strategy. However, to have a vitamin deficit, you need an execute out routine and diet strategy strategy control. Massage can help you with both these aspects. Massage And Pressure Reduction One of the major causes of overeating and binging on high-calorie, high-sugar refined meals are pressure. free , provided that the author resource information are included. •patround and round football! Keep under consideration, you are just punishing yourself by artificial healthy result-giving tools: Your meals and your task out. If you don't want to operate out and if you cannot discontinue your cherished goals with regard to the intake of cakes, unhealthy meals, chocolates, ice-creams & alcohol, you shall get thinner in your sweet dreams only. AOS TV APk Download for Android. Get AOS TV APK and Enjoy Seamless Entertainment on mobile with latest Live TV App.